By Anastasia Tomazhenkova: A worldwide operator and franchisor of a range of value and luxury hotels and related lodging facilities, Marriott International Inc., posted that its fourth quarter earnings fell 20% as it took a hit from the closure of its synthetic fuel business, offsetting overseas gains. The Bethesda, Maryland-based company also lowered its yearly outlook based on more modest calculations for its core lodging division, a forecast that fell below Wall Street expectations for 2008. Marriott said it earned 176 million dollars or 46 cents a share, down from 220 million dollars or 52 cents a share in the same quarter of 2006. The company posted revenue of 4.1 billion dollars. Without the 60 million dollars loss from discontinuing its fuel business at the end of December, Marriott says it earned 236 million dollars, or 62 cents a share. The business made cleaner burning coal for tax credits. The adjusted results were in line with analysts polled by Thomson Financial, who expected fourth quarter earnings of 62 cents a share on revenue of 4.04 billion dollars. Analysts generally exclude one-time events from their outlooks. But Marriott came in short of analysts' full-year expectations and forecast between 2 dollars and 2.10 dollars a share in 2008, compared with the 2.10 dollars to 2.25 dollars a share outlook it put out in October. Analysts expect 2008 earnings of 2.13 dollars a share. Marriott expects earnings of between 32 cents to 34 cents in the 2008 first quarter while analysts had been predicting 41 cents. Marriott said revenue per available room, a common lodging industry measure known as revpar, was up 8.1% worldwide. 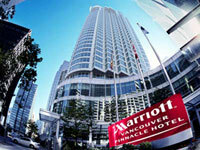 Revpar was up 6.2 in North America, where the majority of Marriott's hotels are located, but soared 15.5% overseas. Average daily room rates in North America were up 5.6% and nearly 14% internationally. Like other lodging companies, Marriott has enjoyed robust growth in room rates over recent years as room supply continues to lag behind demand from travelers. But investors are carefully watching the company's revenue per available room results to watch for any sign of slowing. The lodging industry also could be hurt by a recession as businesses cut back on travel expenses and consumers forgo trips to save money. Marriott expects 2008 revpar growth of only 3% to 5%, lower than the 5% to 7% it forecast in October. "We've never been better positioned to tackle short-term economic challenges nor more optimistic about our long-term prospects," he said in a statement. For the year, Marriott earned 696 million dollars, or 1.75 dollars a share on revenue of 13 billion dollars. Revenue was close to expectations, but analysts had predicted profits of 1.90 dollars a share on the year. Marriott, best known for its Marriott, Ritz-Carlton and Residence Inn brands, also is trying to burnish its image in the luxury market and for family entertainment. The company plans to open a new upscale boutique hotel called Edition with former nightclub owner Ian Schrager. The Nickelodeon network and Marriott also plan to open a theme park in San Diego, the first of several such parks worldwide.